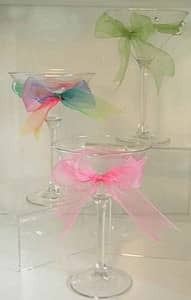 Asta's Jolie Ribbon Martini Glass with colored ribbons threaded through six permanently attached, glass loops. The glass is a dainty, 7oz., 6.75 inches high martini glass. We love this glass for holidays, because the ribbons can be changed to match any decor, colors, or themes! Black and silver for New Year's Eve or green and red plaid for Christmas anyone. This is also the perfect wedding toasting glass because it can be changed to match the wedding colors in a flash. Just be sure to get them for the bachelorette party too! 7.25 oz.